Attention Parents: Seamless Summer Option provides any person 18 years and under free meals Monday through Thursday; meals include milk, juice, grain, protein, fruits and vegetables. 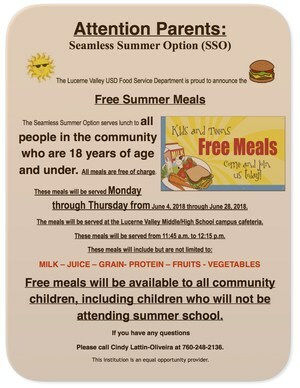 The Lucerne Valley Unified School District Food Service Department has announced the Free Summer Meals program. The Seamless Summer Option (SSO) serves lunch to all people in the community who are 18 years of age and under. All meals are free of charge. These meals will be served Monday through Thursday, June 4, 2018 through June 28, 2018. 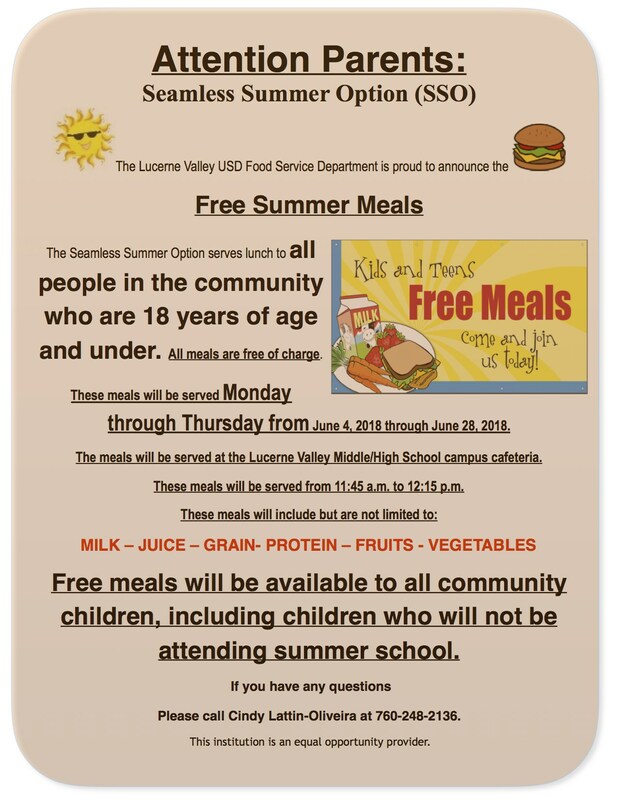 The meals will be served at the Lucerne Valley Middle/High School campus cafeteria. These meals will be served from 11:45 a.m. to 12:15 p.m. These meals will include, but are not limited to, milk, juice, grain, protein, fruits and vegetables. Free meals will be available to all community children, including children who will not be attending summer school. If you have any questions, please call Cindy Lattin-Oliveira at 760-248-2136. The Lucerne Valley USD is an equal opportunity provider.